Kannabia Seeds Company is one of the pioneering seed banks in Spain. 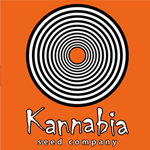 With many years experience of growing and producing the highest quality marihuana seeds, Kannabia have recently stabilised their strains to make them even better. They now have an even larger variety in their catalogue and they\'ve also increased the number of mix packs to provide more options to enjoy several of their strains in the same packet.